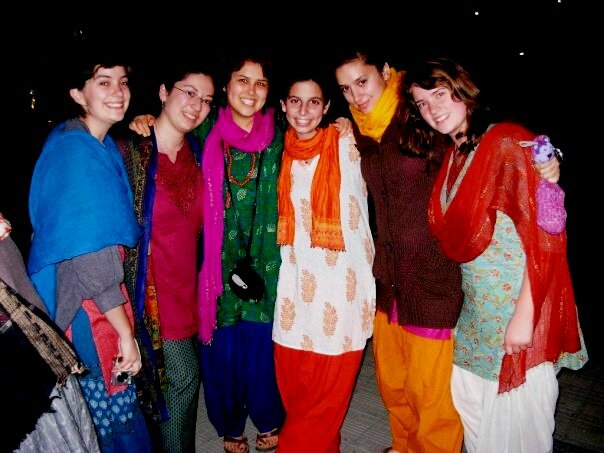 When I first came to India as a student, all of the females on my program were instructed to dress rather conservatively, so as to display cultural sensitivity and to avoid any unwanted attention. For most of us, this meant dressing every day in salwar-kameez, which consisted of a type of baggy, drawstring pant; a loose top long enough to cover the bum; and a coordinated scarf (see photo below). Additionally, I was trying to be frugal while in India, so I bought most of my salwar-kameez at open-air bazaars, where they weren’t the best of quality, but were so, so inexpensive ($5, maybe, for a whole outfit). Plus, I loved all of the different colors and patterns from which I could choose and coordinate. One night, a friend and I were invited to a party at my fiance’s house. (At that time, he and I had only just met and were not yet dating.) My friend and I, without even thinking, dressed for the party in our salwar-kameez. After all, that was all we had to wear. At that point, my friend and I looked around, and realized that we were the ONLY two people at the party not wearing western clothing. All of the other women were wearing designer-label jeans and tops, and there we were in our $5 salwar-kameez. We were a bit embarrassed, to say the least. Fortunately, everyone was kind about it and we were able to laugh it off. But this anecdotal incident raises a bigger issue, and one that I’ve struggled with from time to time. How should a western female (In my mind this problem doesn’t apply as much to men. Jeans and a collared shirt will work for a man in almost any situation.) dress in India so as to display cultural sensitivity, while still keeping up with stylish young Indians? Well, what I’ve found so far is that it’s kind of a compromise, and it’s all about knowing where you’ll be and with whom. On the one hand, Delhi is an urban metropolis, and many of the young, hip Dilli-wallas are very aware of and open to western clothing trends. For example, many of the bars and nightclubs in Delhi have dress codes that do not even allow people in Indian ethnic-wear to enter. But, on the other hand, there are still some very traditional and conservative people and places in the city. While dressed in western-wear, (i.e. a short-sleeved tee-shirt and capris) I have, on a few occasions, found myself in more conservative parts of the city. Every time that happens I always wish I were wearing a traditional suit, or at least had a scarf or shawl to cover my bare arms. – In night clubs or bars, western-wear is a must. And the nicer, the better. Just make sure that it’s not too revealing, especially if you’ve come unescorted. – It’s always a good idea to carry a scarf. Whether it’s because you need to cover up a bit more, enter someplace where you need to cover your head, or simply because you’re feeling a bit chilly, carrying a spare scarf around in your bag never hurts. – Full salwar kameez is a good choice for more conservative occasions. For example, if you are meeting older Indians for the first time, or are traveling to a more traditional part of the city, like Old Delhi. Otherwise, I’ve found that a combination of Indian and western-wear is perfectly appropriate for most situations. My favorite combination is a kourta (very similar to salwar; a loose-fitting top long enough to cover the bum) with blue jeans. I find that it’s just the right mix of Indian and western for any day-to-day situation. Plus, that way I still get to indulge in choosing and wearing the Indian colors and prints that I love oh so much. Sounds like you’ve just adopted the fashion rules of your age group in delhi. 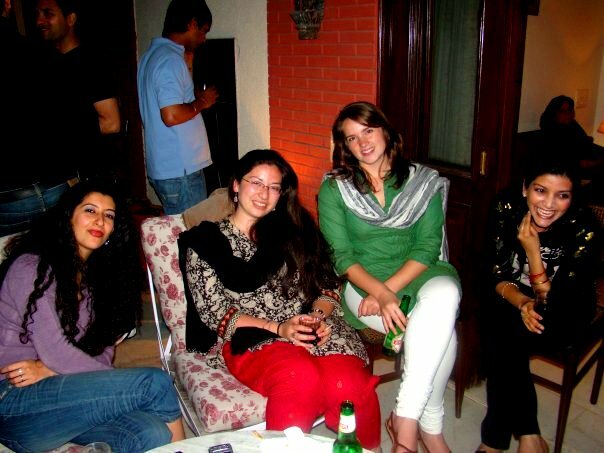 I often saw young women dressed nicely in a lovely kurta over jeans. Usually they are bought in more upmarket boutiques such as you’d find at Khan Market or perhaps other department stores. I saw some nice ones in a department store in Calcutta. I always look at those women wearing jeans and think my god aren’t you hot? as in sweaty? I couldn’t feel comfortable in jeans except perhaps in winter. I am surprised about the covering the arms thing. I never noticed there was any need to do this. People all over india, even conservative people on a gurdwara don’t object to bear arms but there they do object to bear legs, even exposure of the calf. Read with interest. Wondered if you could advise with mens wear. Do you think a white, western man (who’s ignorant about some of the everyday Indian customs/traditions) should wear something like a Kurta? If so – in what occasions? Dont want to come across as culturally insensitive/ sacrimonious / an idiot! While it’s not necessary for a white western man to wear a kurta in India, I think that a kurta can often look quite nice, for both casual and formal occasions, without making the wearer seem culturally unaware. During warmer weather, especially, a kurta-pyjama (a lightweight drawstring pant) set is a much cooler option than wearing western clothing like jeans and a collared shirt. For casual wear, a kurta can be worn over jeans or pyjamas. I think that for men, a plain kurta with little embroidery is best – embroidery makes the kurta look too feminine to my eye. FabIndia is a nice place to shop for men’s kurtas. They have nice color selections, too. For formal occassions, men can also wear a slightly fancier kurta-pajama set, or can go the full nine-yards with a sherwani! Thank you for sharing your experience and writing this article. It is very useful information for me as I’m going to India pretty soon. Thanks for stopping by. I’m glad to hear you found the article useful! Good story. I’m also an American living in India and often find myself in a similar situation. My Indian fiance prefers me to wear Indian-style clothing to reduce the number of stares in public. I feel odd, though, when I see many of the younger generation Indians around me wearing western-style clothing. I almost blundered once and wore a shalwar to a DJ party. That would’ve been really embarrassing. Yeah, it’s a tricky thing to figure out. I’ve found that jeans and a well-cut kurta are best for day-to-day, but definitely not for a party! Part of my adjustment to living here has been figuring out what is appropriate dress for when, since it feels like there are so many more outfit choices here than in the States!